Poll: Would you support the idea of a European army? French President Emmanuel Macron is pushing for the creation of a nine-country European force. 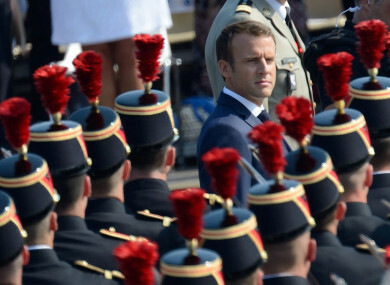 FRENCH PRESIDENT EMMANUEL Macron called for a “real” European army to be established last Tuesday, at the beginning of a week commemorating the centenary of the end of the First World War. The French President is specifically pushing for the creation of a nine-country European force which would be independent from NATO and which could rapidly mount a joint military operation. In June, nine countries - France, Germany, Belgium, Britain, Denmark, the Netherlands, Estonia, Spain and Portugal – signed off on a joint military intervention force. As EU security and defence spending has increased, and after we signed up to Permanent Structured Cooperation (PESCO) in December of last year, some have argued that Ireland’s neutrality is now under threat. So, today we’re asking: Would you support the idea of a European army? Email “Poll: Would you support the idea of a European army?”. Feedback on “Poll: Would you support the idea of a European army?”.